Ladies & Gentlemen, Boys & Girls, Children of all ages the circus is about to begin! "This is real theatre, of which it can truthfully be said that it changes the way you see the world"
"thought-provoking, dignified and profoundly moving but it is also genuinely entertaining"
Amici celebrated their 30th anniversary in 2010 with Tightrope at the Lyric Hammersmith, their biggest, most dangerous, amazingly spectacular show ever, a touching story of an old circus company who have stuck together, struggling against the odds to survive, but will this be their final performance? 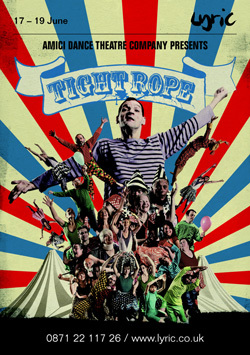 In Tightrope the Amici members were clowns and jugglers, knife throwers and illusionists, stilt walkers and unicyclists; trapeze artists and aerialists and of course there was, the not to be missed, death defying tightrope walker.